We're so excited about the new limited time island-inspired menu items at Tropical Smoothie Cafe! This fast casual cafe is one of our favorite family outings because of its healthier menu offerings and delicious flavors. 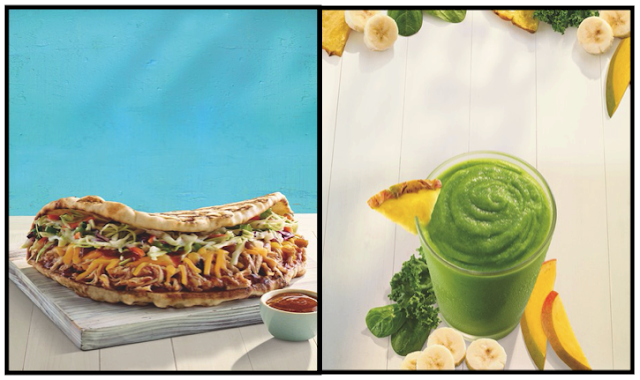 As if we didn't have enough reason to dine in, from now through June 25th, our taste buds will be tempted with two tropical additions: the Hawaiian BBQ Chicken Flatbread and a fresh take on the flagship Island Green Smoothie. Our family has many fond memories of Hawaii and the food was certainly a big part of it.The balance of flavors in these two menu items is spot on with the food we enjoyed in Oahu. Anyone who likes bold flavors of the South Pacific will appreciate the twist Tropical Smoothie Cafe has applied to their traditional menu. Hawaiian BBQ Chicken Flatbread - the Tropical Smoothie Cafe's signature toasted flatbread has been taken up a notch with pulled chicken, house-made coleslaw, cheddar cheese, ranch dressing and sweet and savory island BBQ sauce. It totally transports us back to our trip to Hawaii and the bold flavors of food. Island Green Smoothie - A superfood blend, this smoothie features fresh banana, pineapple, mango, spinach and kale and can be customized to fit personal preference. The newest twist allows guests to add whey protein for a little extra fuel. Not only is this smoothie delicious, it's also loaded with vitamins and nutrients. National Flip Flop Day: Come in to Tropical Smoothie between 2pm and 7pm on Friday, June 16th to kick of the Camp Sunshine Fundraiser and enjoy a FREE Sunshine Smoothie in a NEW limited edition 16 oz. 20th anniversary souvenir cup. To learn more about Camp Sunshine, click here. National Hawaiian Foods Week: To further show appreciation for Hawaiian fare, Tropical Smoothie Cafe has signed on as an official sponsor of National Hawaiian Foods Week, June 11 through June 17, to help raise awareness and celebrate the distinctive flavors of Hawaiian cuisine. Keep an eye out because the celebration includes a sweepstakes where one lucky Tropical Smoothie Cafe fan can enter to win a vacation package to the 2017 Hawaiian Food & Wine Festival! 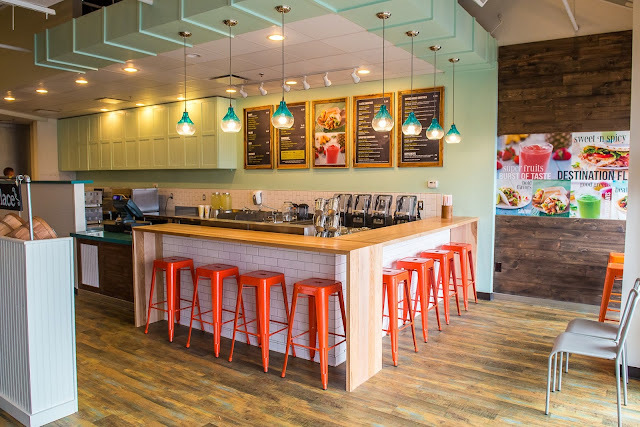 For more information about Tropical Smoothie Cafe and to find a conveniently located cafe, visit www.tropicalsmoothiecafe.com. Disclaimer: This post was sponsored by Tropical Smoothie Cafe. As always, it contains our own, honest opinions.